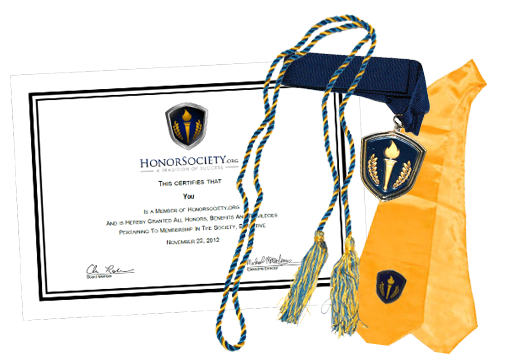 Showcase your membership with a member certificate, honor cords, graduation stoles, medallions and more. Visit the Honor Society store now. From achievement awards to service scholarships, Honor Society has numerous scholarship opportunities available for active members. From on court recognition to private club access, join Honor Society for special access and experiences at your favorite sports team. See the upcoming schedule of events. Be a leader, and connect with like-minded high achievers on your campus. Meet driven, goal-oriented peers and connect with established leaders in the community at the local and national level. Be proud of your Honor Society membership. Honor Society t-shirts, caps, license plate frames and more! Visit the store now. Membership recognizes your achievements, and furthers your opportunities. Honor Society exists to enhance academic and professional success. Our society's goal is to help you succeed, and to connect you with the people and opportunities to help you achieve your goals. We are uncompromisingly driven by our community core values and funded by members just like you, ensuring that our sole focus is best serving our members. Our community exists first and foremost to help achievers like you build relationships with similar values-driven and goal-oriented people and organizations. From the University of Hawaii to the University of Houston, and from Washington State University to Pennsylvania State University, Honor Society has large, active and robust university recognized chapters. Why? It's simple. Honor Society empowers schools to build deeper lifelong connections with high achievers. Honor Society was ranked as one of the top "Honor Societies You Should Join" by College Magazine, and one of the best values in dues based organizations in a survey of our members. Find out why we're the talk of the educational and professional world. The Honor Society Advantage is Clear. Read more about Welcome to Honor Society, an exclusive recognition society.